Who Shall We Send Your FREE* BOOK To? Special Offer Click Here - Yes! I Want This FREE BOOK Now! Get Your FREE COPY Of DATE YOURSELF WELL! "Lennon was right! If enduring love is what you're after, Date Yourself Well will guide you on a transformative journey to the happily ever after you seek..."
> YES! I Want My FREE COPY of DATE YOURSELF WELL NOW! "Holy Hannah! Your book has totally transformed my life!...This is an amazing book, I love how you break it down step by step of how to love yourself, and how to date yourself. I so thank you." That was from an email I received this week from Rachel. She's felt stuck for quite some time. But not anymore. Yay! I receive messages like this all the time, and they always make my day! Perhaps YOUR story of personal breakthrough and transformation will be next? I sure hope so! When was the last time you felt fully engaged in your life? And the BIG QUESTION that allowed me to discover the secrets of dating myself well several years ago: "Do you love yourself?" Uncover the problem with your love...life as you know it. Discover the possibility of a whole new level of love. Recover the sacred process of becoming fully engaged in your life. Accept the proposal of a new love...life. Be The S.O.L.UTION You Seek...AND YOU SHALL BECOME ONE. With 2/3 of all relationships ending in a breakup, I'm on a mission to change that! Teaching brave souls (like yourself) how to Date Yourself Well...The Ultimate Engagement Plan is the first step. “Dr. 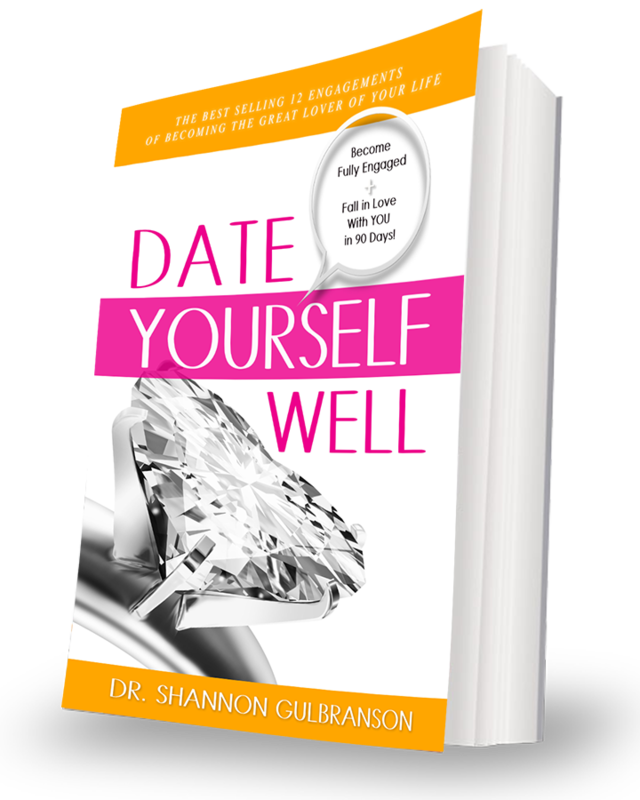 Shannon's fresh new perspective on dating yourself well, and fully engaging in life, is powerfully relevant and highly needed in today's modern era." Who Shall We Send Your FREE BOOK To?